Developers and sysadmins may need to monitor various network parameters, such as bandwidth consumption and the traffic flowing in/out. There are many tools available for this purpose, one of them being vnStat. 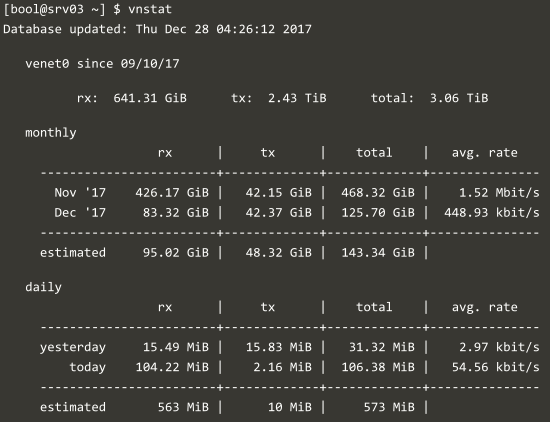 It is a simple CLI utility that shows network statistics over various interfaces and periods for a particular computer. In this article, we will see how to install and work with vnStat, and (optionally) view this data graphically using vnstat-dashboard. This will show a list of all network interfaces available in the system. For this article, we will just monitor the interface representing Ethernet connection to our system, which is eth0 in our example. On your system, you may find the interface named differently, such as enp0s3 or venet0. If you use WiFi, there will be a interface such as wlan0 or wifi0. Any interfaces with names like lo or lo0 represent the loopback interface, which is used for local traffic, such as communication between daemons. By default, vnStat writes fresh statistics to the database every 30 seconds. 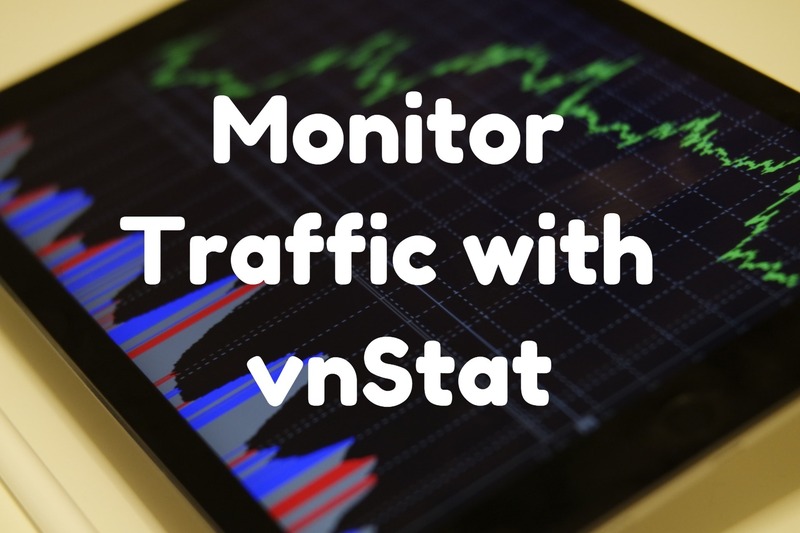 After waiting for 30 seconds, run vnstat to view the monthly and daily statistics in a tabular form. If your system doesn’t receive too much traffic, you can try downloading these files to generate some traffic before viewing the statistics. The “rx” and “tx” columns show the received and transmitted traffic respectively, and the “total” column gives the sum of these two values. The “avg. rate” shows the average rate of bandwidth consumption per second, over the course of the day or month. Then, run vnstat as usual; you will get to see the updated statistics after you do so. -d: Daily statistics for the last 30 days. -m: Monthly statistics for the past 12 months. -w: Statistics for the last 7 days, and the current and previous week. -h: Hourly statistics for the last 24 hours. -t: Top 10 days with the highest traffic. The hourly statistics also feature a graph, along with the “rx”/”tx” values, as shown below. The other switches show a tabular output, like the one in the previous example. Once you’re done, press Ctrl+C to exit. If you want to import the database on to another system, you should first export the database with the --exportdb switch. The following command writes the database to a plain-text file named vnstat_db. 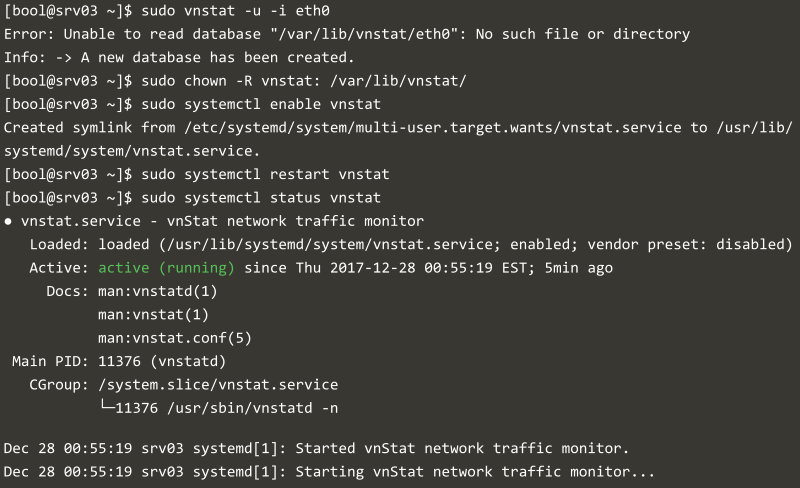 If you want to monitor network statistics over the web, there are various tools that work alongside vnStat. In this article, we will look at vnstat-dashboard, a web application that helps you visualize vnStat data. In order to use it, you need to install a web server, PHP and a few other tools. We will use Apache simply as an example; but you are free to use another web server. You can easily toggle between the hourly, daily and monthly tabs and also switch between various network interfaces. 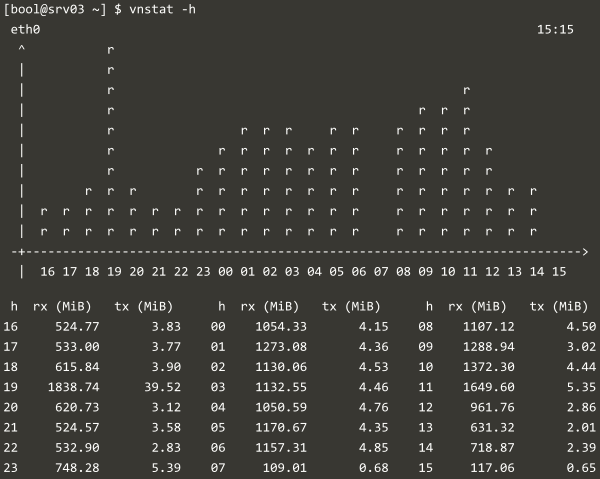 vnStat is a very useful tool to monitor and analyze network information of a system. There are a variety of options available to view and log the data of network interfaces which can be used for several use cases.